First of all, let me say that all I did here was a) have an idea and b) shove Maxis textures around. The mesh is all Sentate and the defaulting is all Changeling. I'll probably repeat that several times, but I just want to put that out there. So, in Apartment Life, Sims can be witches and wizards and warlocks again (the thing about the word 'warlock' is that it means 'truth twister' and is technically a term for a malicious wizard. 'Witch' and 'wizard' both derive from 'wise' and are morality-neutral in their etymology), which is awesome, and they get neat outfits and hats and the ability, at the highest skill in either light or dark magic, to summon a spectral assistant. When summoned by the self-interaction Appello Servantus spectral assistant functions a bit like a non-controllable Servo; she cleans things, she fixes things, and if she gets bored she'll have a glass of water that will fall right through her and need to be mopped up before she disappears. Summoned on another Sim through Sevantus Attackum, the spectral assistant pretty much just functions as a bouncer. Like Servos, the Spectral Assistants use invisible skin and eyes by default, which makes them excellent candidates for... well. For being Bonehilda. As a bonus, you can grab the original Body Shop files for Good, Neutral, and Evil Bonehilda, so if you want to use Sim Surgery on a Servo or something, you totally can. (I'm also including the Headless Sim and invisible eye files Sentate included with the original Bonehilda Servo; these are from somewhere on MTS and the filename for the invisible eyes is a string of random numbers. 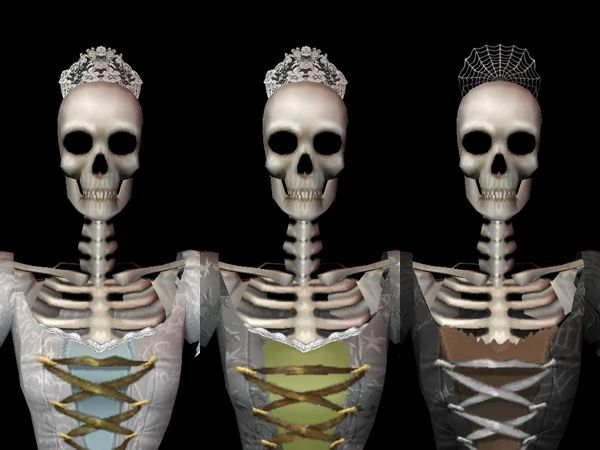 I didn't make them, Sentate didn't make them, but if you want to do things like make Skeleton maids with hair (some hairs work okay!) or eyebrows or freaky floating eyeballs, they're handy files to have.) The Bonehilda outfits are categorized as Everyday only, and do not have a fat morph (there's nothing much to GET fat on Bonehilda). I have no idea if they have a pregmorph or not, but you know? I kinda doubt it. I'm also offering ANOTHER bonus-- K8's Fairy Witch gowns from Parsimonious done up with the Apartment Life witch textures. My game is Medieval (everyone and their monkey's uncle knows this), and while I find the AL witch outfits adorable, they're far too short for my purposes. The Fairy Witch gowns are nice and long and are mapped... similarly. It's definitely a fantasy style, but if I can't have fantasy in my witches, well, where else can I put it? The FairyWitch mesh has a fat morph, but I don't know if it has a pregmorph or not. If it had a Teen conversion, I would be begging for default replacements. Anyway, the dresses are categorized for Casual, Formal, and Outerwear, and they all have their own bump maps so the brocades look pretty instead of weird. Okay, so, now comes the time where I give instructions and credit and thanks. To use Bonehilda as a default Spectral Assistant, you must of course have Apartment Life. The Bonehilda recolors and Fairy Witch gowns will work with just the base game. 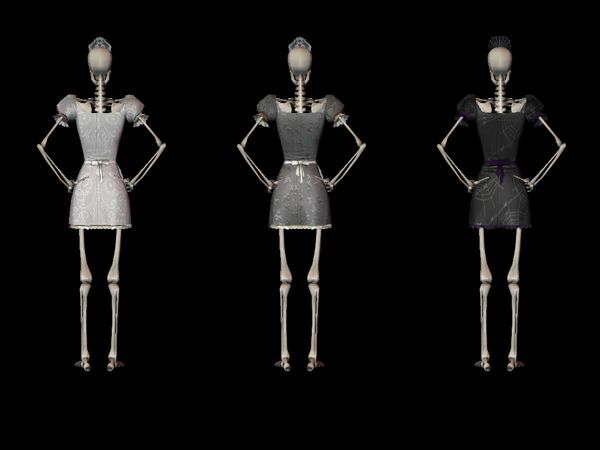 Credit must go to Sentate for the mesh and the idea for Bonehilda, and K8 for the Fairy Witch mesh. Second, FaeChangeling for encouragement and for defaulting the crazy things. (I just realized Bonehilda-as-Spectral-Assistant would work and made the textures. All the hard work came from faechangeling.) As ever, I have to thank Lyn for making sure I had a working copy of Photoshop, otherwise I wouldn't be able to moosh textures around at all, and Quaxi for SimPE, without which nobody would be able to do very much of anything. All the actual textures are by EAxis, including the skeleton. Naturally, everything has been compressorized, so make sure to clear your cache files after installing. As far as policy goes on this one, anything with Bonehilda is non-paysite-friendly as Sentate is non-paysite-friendly, and the Fairy Witch witches follow my policy on the sidebar, which I can guarantee is just as legally binding as TSR's TOU. In short, do what you like with whatever you like, just remember that credit where credit is due makes the world go 'round, or something like that. Okay, so that's that taken care of, have some download links! Hey, you want some MORE download links? Conversions and morphs and defaults happened for the Fairy Witch dresses! Nothing here is my work but the textures. DOWNLOAD Morganna's default replacements for Apartment Life's afbodywitch and tfbodywitch in Good, Neutral, and Bad! Sorry to be so late getting back to you! I hope you tried LJ again. They sometimes have issues, but I was able to see the Bonehilda post just fine. It's not you, it's LiveJournal.